This is probably the dorkiest post I’ve ever written. Recently, my parents came to visit and my mom brought me a bunch of things from my old bedroom closet, including my high school letter jacket. I hadn’t thought about that thing in years, and now it’s sitting in my dining room while I figure out what to do with it. The jacket has vinyl sleeves, made in the USA from “recycled fibers” and “other unknown fibers,” and it’s starting to break down. The sleeves are excreting some kind of greasy substance that feels, when you touch it, like cooking oil. I’ve tried cleaning the sleeves with a variety of different cleaners, and that gross, sticky feeling comes right back once the sleeves are dry. At this point, I’ll probably have to take it to the dry cleaners so they can properly care for it. Not that anyone wants it. I went to a really big Texas football school (think Friday Night Lights times ten) and letter jackets were a big deal in my day. I don’t know if high school kids still get letter jackets, but it was definitely a competition when I was in school in the mid-1990s. 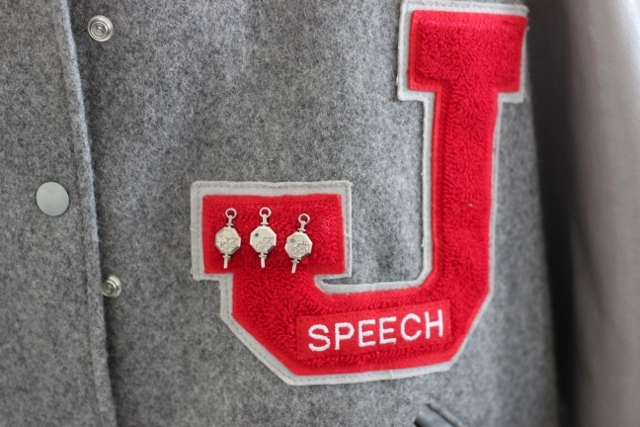 I was active in Speech, which is saying a lot right there, and I think I earned my letter after a UIL tournament. Ryan was in band and had a red letter jacket that was soft and supple to the touch, but my jacket was academic, so I got grey. I remember being so unimpressed with it, the puffy sleeves that didn’t bend, the itchy wool collar, and the awful, fake leather smell. I hung it outside for days on end to get rid of that odor, and then I barely wore the jacket at all, despite the fact that I had worked hard for it. I never wore Ryan’s jacket because I was a die-hard feminist and could earn my own jacket, thank you very much, but mostly, I just wore the winter coat my parents bought for me. What’s hilarious to me now is the jacket itself. I mean, it says “Speech” right there, loud and clear, for everyone to see. And those pins? 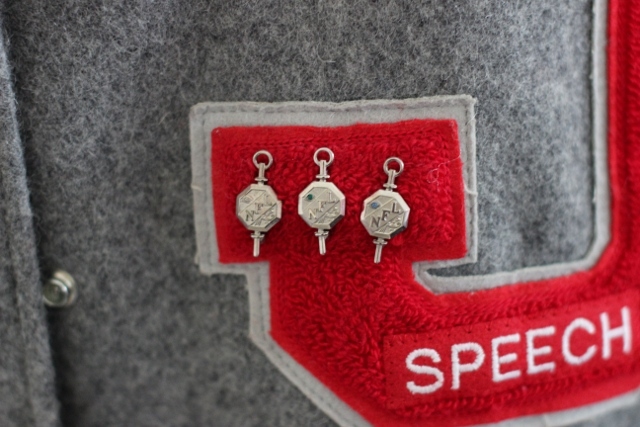 Those are NFL pins, as in the National Forensic League, which members of high school Speech and Debate teams join. You get points every time you compete in a tournament, and so many points equals a pin. I was mediocre, at best, but I worked hard and earned quite a few pins. Exciting, isn’t it? David Sedaris, the hilarious author, recently shed a bit of light on the world of Speech and Debate when he mentioned it in the opening to his newest book, Let’s Explore Diabetes with Owls. My days of competing in Poetry, Prose, and Oratory are a thing of the past now, but it was fun reliving those memories for a moment when I read his book this summer. He was just becoming famous when I was in high school, but his essays would most definitely make for entertaining competition pieces, read out of a small black binder. Don’t get me wrong, Speech and Debate clubs are great organizations, and lots of talented kids go on to become actors, lawyers, and, I’m guessing, politicians. Oprah Winfrey herself is an NFL member, as my Speech coach always told me, and supposedly, she gets points for every public speech she gives. I wonder how many pins she has. That’s basically the story of my high school letter jacket and how I came to earn it. I know my boys won’t be interested in it, and I barely wore it myself. But it’s a piece of my history, so I guess I’ll have it cleaned and store it away. Maybe one day I’ll have a granddaughter, and she’ll ask me about it. Who knows. Cool! too bad they didn’t make the sleeves out of sturdier stuff. I know. I’m hoping the professional cleaning will help. I did debate in high school! But I was terrible at it and quit after a year or so. 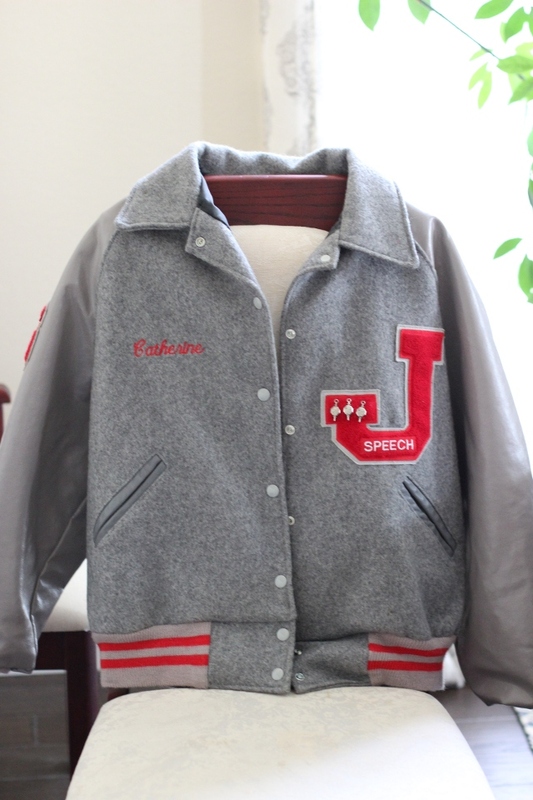 I got a letter jacket, though I’m not sure for what because I wasn’t really involved in anything you could letter in. I was heavily involved in the school yearbook/newspaper/magazine, so I had “journalism” stitched onto the back even though journalism didn’t have their own letter jackets. That’s awesome that you did debate! I didn’t, but we would go watch our teammates when our rounds were over. I found it fascinating and really weird, too. This one guy would do push-ups while the other team was talking. Letter jackets are such a foreign concept to me, haha! My school had a system where every academic accomplishment got a numeric point (so a grade over 80% in a class was worth more than 70% kind of thing) and every year at an awards ceremony, if you passed a certain threshold of points, you got something, two of which were letters. I think I got my junior and senior Ns, which I did absolutely nothing with — they were just literally the letters! I guess I could have put it on a jacket but nobody did that. That’s so interesting. I guess there are so many different systems, and our jackets were just for extracurricular activities. I went to go see David Sedaris at the Long Center and he talked about his inspiration for his essays at speeches. I need to find someone performing them asap. I can only imagine the hilarity! PS-I got my jacket in swimming, but never wore it either. I ended up giving it to my brother. Any update on the sleeves of the jacket? Did cleaning help?